This winter has been a rough one, but the end in sight-it’s almost time to spring those clocks ahead for Daylight Savings Time! Even though you won’t need to worry about resetting anything until March 8th, it’s still a good idea to get into the spring mindset (who knows, maybe it will help speed things along!). If you decide to start the spring cleaning a few weeks early, we’ve got a great deal for you to take advantage of the new ScanMyPhotos VIP Discount! This was how spring cleaning looked in 1941! 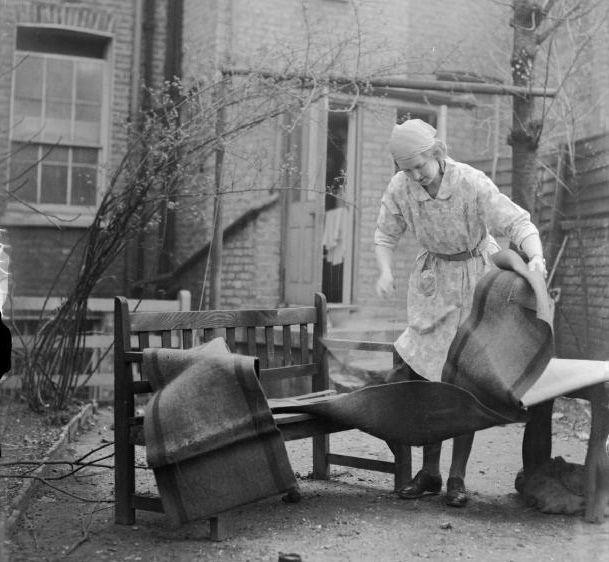 This woman undertakes a spot of Spring cleaning in the garden of her London home. Divide your field of view into nine boxes – it really helps you take better pictures. Shift your horizon so it’s not in the middle of the frame but in the top or bottom, or shift so your subject is to the right or left. Read more. Your loved ones can light up your life—in more ways than one! Use your photos to create a beautiful lamp that will be sure to brighten up your days. Check it out. This entry was posted in Uncategorized by Monika Jansen. Bookmark the permalink.